This is one of my go to meals when time is at a premium. 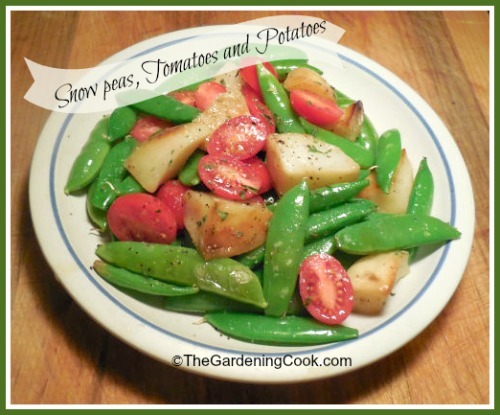 The whole recipe for sugar snap peas, tomatoes and potatoes can be made in about 10 minutes. Yet, the flavor is full and my family loves it. Now that the vegetable garden has started producing garden peas, this recipe gets used often for us! Normally, I cook this with just sugar snap peas and tomatoes but I had some roasted potatoes left over from last night when I made my roasted root vegetables, so I added them as well. They made it into a very different dish which is a bit more hearty but still garden fresh. Would also be lovely with new potatoes. 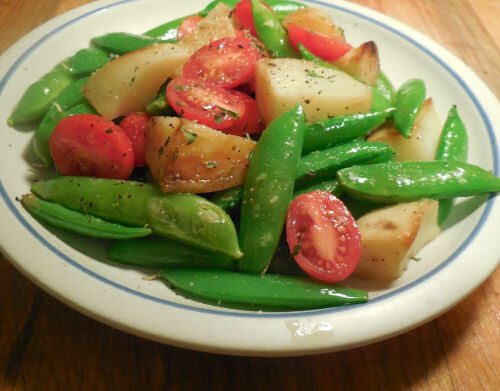 All that is needed for the dish, is just a very quick saute of the sugar snap peas in olive oil and butter and then add the cut tomatoes for the last minute or two. Stir in your cooked potatoes until well combined and serve. What could be easier. What I love most about this dish is the color! It is so vibrant. Is your garden producing lots of vegetables and you don’t know what to do with the harvest? Try The Garden Fresh Vegetable Cookbook, by Andrea Chesman. It is full of great ideas and is available in hard cover from Amazon.com. Do you have a favorite go to dish that you serve when time is at a minimum? Please share it in the comment section below. 4 ounces Roast potatoes from a previous meal (optional but adds a nice touch to the dish if you have them. Add the butter and olive oil to a pan over medium high heat. Saute the sugar snap peas for about 2 minutes. Do not over cook them. They should still be slightly crisp. Add the roasted potatoes if you have them and stir until warm. Toss in the halved baby tomatoes and stir for about 1 or 2 minutes. Sprinkle with a bit of parsley, stir and serve immediately.